If you already own Deckcelence or purchase along with this, then you get this ebook free. 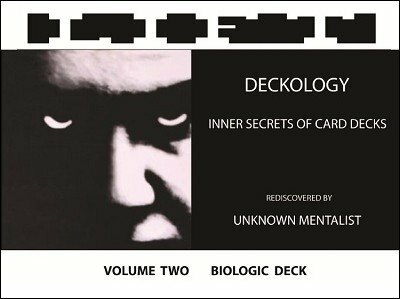 A fascinating combination of Biology and Numerology in this volume of Deckology . A deliciously novel flavour of "Scientific Mysticism". You will discover weird secrets in your deck of cards which will enthrall and mystify your audience. Every card trick of yours, especially card mentalism effects, will look more baffling and more interesting for the spectators when you build in this theme of "Scientific Mysticism". Also included is some useful bonus information for magicians and mentalists for use in their patter and presentations. Deckology adds a brilliant dimension to mentalism with profound patter while performing with a deck of cards . In the Biological deck, the linkage of each of the 52 cards to the human body , could enhance the mystery of the effect and add to the impact of a revalation . Audience members would be in awe of the mentalists with the use of such patter that could portray a deep knowlege of the human body and anatomy . I found the suggestive high impact phrases and psychological images very interesting .......and these could be powerful tools to add verbal and visual shine to performances !